I'm just finishing my final "author's proofread" of the new chapters for The Network Migration Workbook. 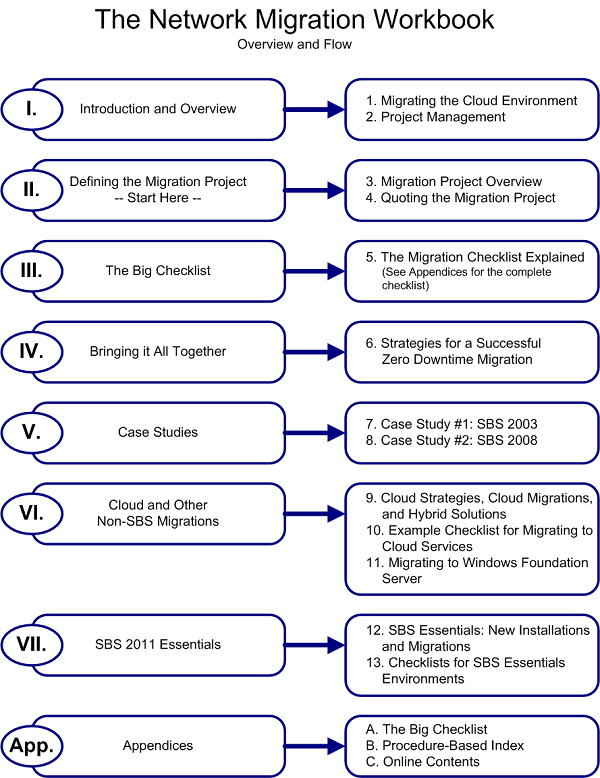 In addition to a re-write of The Big Checklist (270 pages), we have ten new checklists for migrating to cloud services, Windows Foundation Server, and SBS 2011 Essentials. The new edition of The Network Migration Workbook concludes with a thorough discussion of building your business around these "Lite" servers and combining them with cloud services. We have over 150 pages of new content in the book (and remember, it's 8.5 x 11 in size). As I read through the last page of the book, it occurred to me that it's a pretty good endorsement for building a business model around these new products. Here's that last page. As you can tell from the last two chapters, plus Chapter Nine, we think SBS Essentials is a great product and a great addition to the Small Business Server family. But we can't forget that it's still a complicated product. And while we respect Microsoft's goal to create network that's easy to install, we're not there yet. As with any migration project, SBS Essentials requires planning and forethought. Granted: It's a whole lot easier than a full SBS Standard migration, but it still has some serious gotchas. Primarily, you need a very clean network and you need to tune up those desktops! Having said that, SBS Essentials has proven to be a very robust product. As an experienced technician, you won't find any real "stoppers" here. The problems you'll run into are very familiar. They'll be things like incomplete profiles, missing mapped drives, and poking around for an NK2 cache file. Between the Big Checklist and this chapter, we think you have all the information you need to solve these problems. 1) Know what you know. Document the network and do a complete discovery. 2) Prep the network. Set it up exactly as you want it before you open the server box. 4) Separate network prep and desktop prep from the server installation. 5) Plan your installation. Don't think of a domain name while you're running the setup. 6) Document, document, document. That means document what you found, what you did, and the decisions you made. Write everything down and build the client's Network Documentation Binder. We believe that there is so much opportunity as the Small end of the Small and Medium Business market that you could make a business doing only SBS Essentials installations combined with a few cloud services (e.g., Exchange, hosted backup, hosted spam filtering). On the downside, you will have to deal with clients who have historically been "cheap" with their networks. And you'll see a lot more of the do-it-yourself business owners. But even there, you can focus your business on the micro businesses that are now ready to make a investment in technology. Microsoft has made a big commitment to this very business model. They want you to sell their server into this market and combine it with hosted services. This hybrid model of on site and hosted services works great for them. As a result, the Technet web site and SBS blog are filled with lots of great information in support of SBS Essentials. Google almost anything that begins with the phrase "SBS Essentials" or "SBS 2011 Essentials" and you will get good, useful hits on the Microsoft sites. As a couple of Microsoft-centric geeks who have been supporting networks from 1-2 users to Fortune 100 companies for more than twenty years, we are very happy to see that companies like Microsoft are still creating niche products that fit perfectly in the small business market. Remember: Registered book owners can download all new content for no additional charge at www.zerodowntimemigration.com. - Still the best Quick-Start Guide to Managed Services! Now only $39.95 at SMB Books! - Check Out the #1 ranked Managed Services book at Amazon! Buy it as a printed book or ebook!